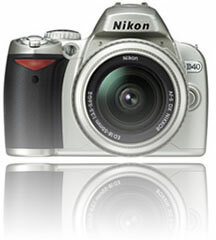 The new Nikon D40 seems to be the replacement of the Nikon D50. It gains some techniques from the D80 (auto ISO) and looses some from the D50 (top LCD). As the rumors told already, it has no internal focus motor so all non AFS lenses are now manual focus! The other surprise is that Nikon did not find the need to increase the number of pixels on its entry level camera. So I wonder if the pixel race is over and that manufacturers start innovating in other directions (low light, price). The camera seems much smaller then the Nikon D50 and any other Nikon DSLR before and I wonder how it feels and if the weight is ‘right’. For more information see the Digitutor. In the digitutor it looks like this camera is especially targeted for women. You do not see a man using the camera but always women! For an entry level camera it is also surprisingly fast with 2.5 frames a second. This has always surprised me a bit why they make them so fast. I guess it does not have any added costs as al electronics can be the same and no expensive hardware (more expensive motor) is required.